Brad Evans & Travis Jensen . 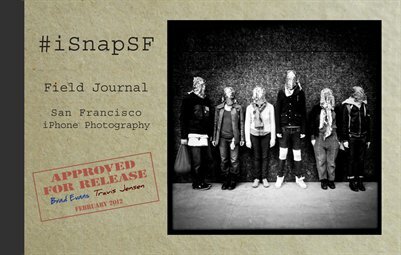 #iSnapSF Field Journal is the result of over 2,000 images snapped on the streets of San Francisco over the last four months using iPhone 4 devices and Hipstamatic app. It's comprised of 42 images, ranging from candid street scenes to street portraiture as well as other urban scenes and oddities. Our goal when putting iSnapSF together was to show that it’s not about having the best camera, but rather always having a camera with you. We believe that street photography is about having an eye and being receptive to your surroundings. All #iSnapSF Field Journal proceeds in excess of printing costs are being donated to Larkin Street Youth Services, a San Francisco-based non-profit organization that provides various support services, including shelter, medical, meals, and counseling, for at-risk youth ages 12-24 living on the street. Please join us for the official #iSnapSF launch party and exhibition at the Haus of Hipstamatic on Thursday, Feb. 23, 7:00-9:00p.m., 74 Langton St., San Francisco, CA. 94103.